". When I was making my second trip to the refuse station one day last week I saw this scene clearly. It is not as if I had not driven past these two symbols a hundred times or more over the past three years. However, it was while I was pondering my latest contribution to global environmental pollution that their significance stood out clearly. 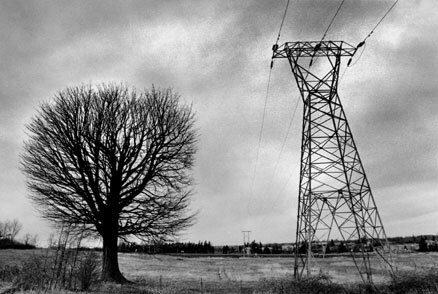 This tree and power line transmission tower stand side by side adjacent to Slater Road, on the way to our county garbage dump. I saw this oak tree symbolizing natural earth forces while the power grid provider attested to our tremendous physical necessity to live "comfortably"
on our planet. Air, water, oil, timber plus an endless variety of mineral, plant and animal life are dissipated daily to appease the human population's material needs. Pathetically adding further to eco-damage I joined the masses directly responsible for refilling our fragile earth with my own undesirable waste.